Computational modeling seeks to simulate biomolecules, particularly proteins. The dream of computational biologists is that their simulations realistically mirror the structure and dynamics of proteins, which act as molecular machines in living cells. 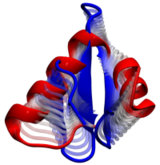 Indeed, when researchers tried to simulate how a nascent protein folds into its known shape the chosen protein, called WW domain, did not fold properly (see the May 2008 Highlight). Until recently, simulations could follow protein movement for about 0.0000001 seconds and the computational mirror seemed to work well. Recently, however, simulations with the program NAMD began to follow proteins for almost 0.0001 seconds, a thousand times longer, and the mirror showed cracks. Thus, a question arose as to what went wrong and how the distortion could be repaired. It was unclear whether the simulations still did not last long enough, or whether the physical interactions in the protein were poorly described in the computer model that was used. As reported in a recent paper, the interactions show subtle errors, significant enough to throw off the energy balance in the folding protein. Fortunately, the results suggest ways to improve the computation of physical interactions to fold proteins more accurately, repairing the cracks in the mirror. More information is available at our protein folding website.